Gold edged higher overnight, trading in a choppy fashion - but confined to a tight range of $1242 - $1246.15. It continued to fade movements in the US dollar which moved modestly lower from 97.50 – 97.34. 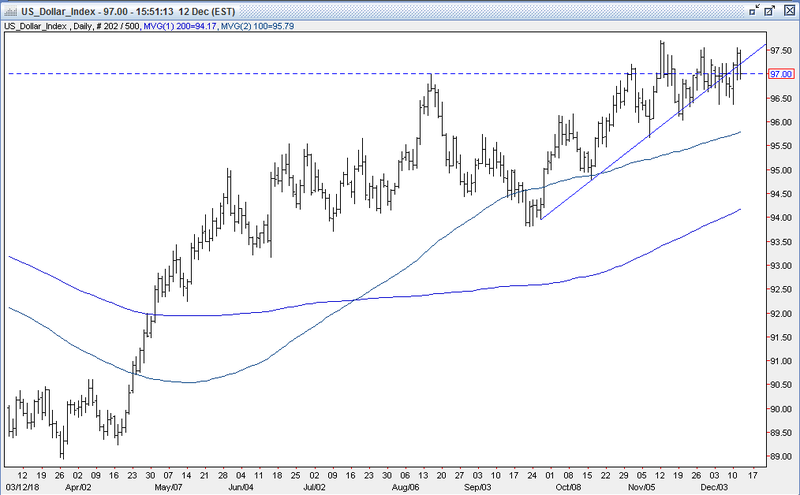 Gold sank to its $1242 low (double bottom support, 12/10 and 12/11 lows) as the DX traded up to 97.50. The dollar was supported by a fresh plunge in sterling ($1.2477 – fresh 20-month low) and a dip in the euro ($1.1314) as UK MP’s triggered a no-confidence vote on PM May’s leadership for later this evening. However, gold rebounded during later European time to its $1246.15 high as the DX retreated to 97.13. The dollar was pressured as the pound ($1.2606) and the euro ($1.1364) rallied back as analysts predicted May would win the confidence vote. Stronger global equities were a headwind for gold with the NIKKEI up 2.2%, the SCI up 0.3%, European shares were up from 1% to 1.7%, and S&P futures were up 0.7%. Reports that US and China were making progress on trade negotiations (Trump said he’d get involved with Huawei case if it would be helpful, Canada granting bail to Wanzhou, China working to increase access to foreign companies – replacing the Made in China 2025 plan, China cutting tariffs on US autos to 15%, Trump said talks between US and China were ongoing, and confirmed he wouldn’t raise tariffs on Chinese imports until he was sure about a comprehensive trade agreement) lifted stocks, as well as firmer oil prices (WTI to $52.80, API reports huge draw in US crude stocks). At 8:30 AM, the US CPI Report was as expected (headline flat, core up 0.2%), with little consequence to markets. However, US stocks continued to climb on their open off of the positive developments on US-China trade negotiations. The S&P was up 35 to 2672, with the Energy, Health Care, IT, Materials Industrials and Consumer Discretionary sectors leading the advance. The US 10-year bond yield rose back above 2.90% to 2.906%, but the DX retreated. Further strength in the pound ($1.2665) and the euro ($1.1379) knocked the DX back to 96.96. Gold was caught in the cross-currents and rose modestly to take out the overnight high to reach $1247. In the afternoon, US stocks rose further (S&P +49 to 2685), aided by a successful IPO of Tencent Music, but despite a pullback in oil (WTI to $51.64, EIA reported smaller than expected draw in crude, unexpected build in gasoline). The dollar remained under pressure though (DX to 96.89) with the pound bouncing around session highs ($1.2660) and the euro gaining ground ($1.1387) as PM May became highly likely to win the no-confidence vote after offering a compromise not to stand for election in 2022. 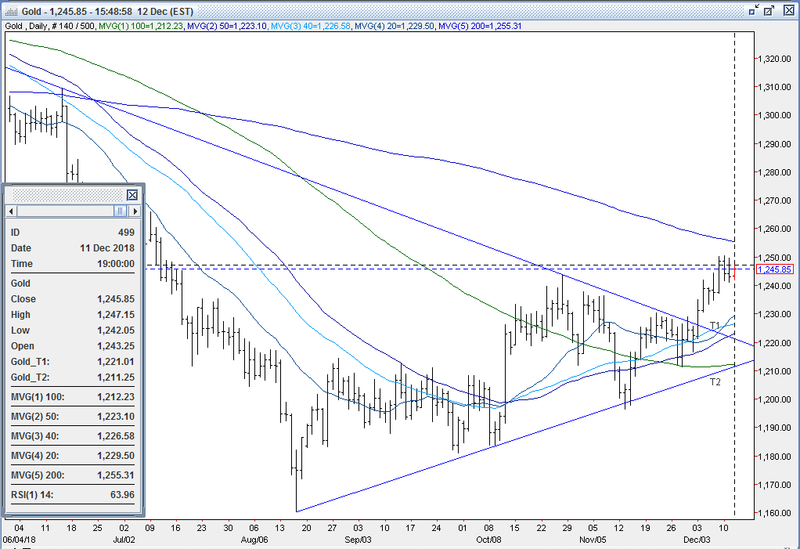 Gold edged higher in response and made a new high at $1247.30. However, shortly thereafter, the results of today’s $24B in 10-year notes were mediocre (2.915% yield), taking the 10-year bond yield up to 2.913%. 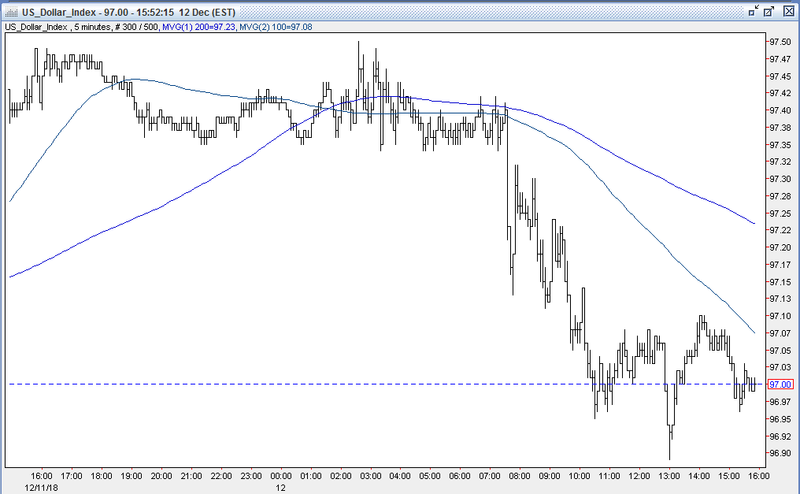 The DX bounced back over 97 to 97.05, and gold retreated to $1244. Later in the afternoon, equities trimmed gains (S&P finished up 14 to 2651), while the US 10-year bond yield hovered around 2.91%. The DX traded edged down to 97, and gold clawed back to $1246. Gold was $1245 bid at 4PM with a gain of $2. Open interest was off 1.5k contracts, showing a small net of long liquidation from yesterday’s decline. Volume was lower with 199k contracts trading. While bulls will take today’s $2 gain, they remain flustered by gold’s inability to crack the $1250 resistance level again today - especially when the DX dipped below 97. Bulls were looking for a breach of this level to bring the 200-day moving average at $1256 into play – above which they expect significant buying. However, bulls were encouraged that despite the strength in equities and the 10-year bond yield re-taking the 2.90% level - that gold held fairly well, with support holding ahead of $1243 – the prior resistance level. Bears remain encouraged that gold failed once again to rally past $1250 today, despite the dollar taking a foray under 97. Bears remain comfortable selling into strength, feeling moves toward overhead resistance at $1250 and $1256 will continue to provide good entry points for short positions – especially with gold approaching overbought (14-day RSI = 64). This is witnessed by Monday’s COT Report that a shows a very large gross short position (124k contracts) still remains. Bears will look for a breach of initial support at the trendline at $1221 to bring about a re-test of $1212 (100-day moving average, double bottom), $1211 – the up trendline from 8/16 $1160 low, and then $1200. All markets will continue to focus on geopolitical events (especially Brexit developments), developments with the Trump Administration (especially on US-China trade, potential legal issues), oil prices, and will turn to reports tomorrow on China’s Foreign Direct Investment, German CPI, the ECB Rate Decision, US Import Prices, Export Prices, Jobless Claims, and comments from the ECB’s Draghi for near-term direction.